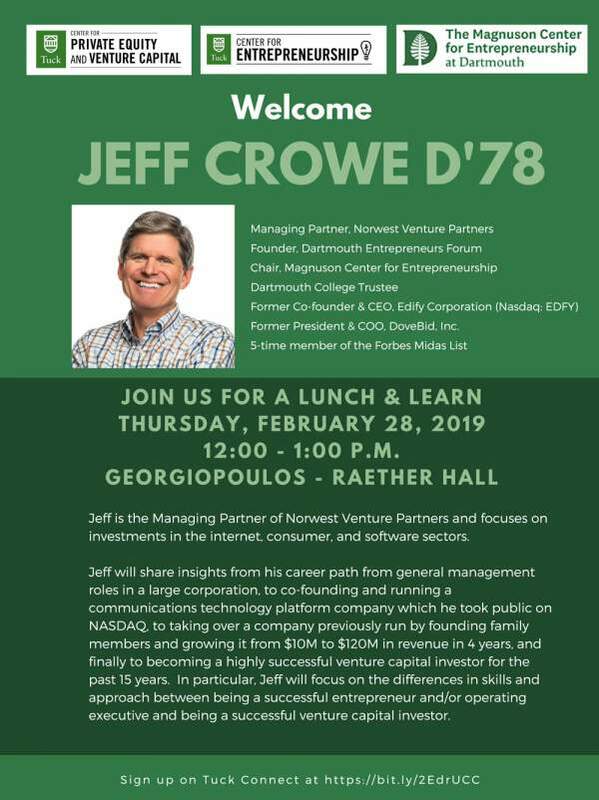 Jeff is the Managing Partner of Norwest Venture Partners and focuses on investments in the internet, consumer, and software sectors. Jeff will share insights from his career path from general management roles in a large corporation, to co-founding and running a communications technology platform company which he took public on NASDAQ, to taking over a company previously run by founding family members and growing it from $10M to $120M in revenue in 4 years, and finally to becoming a highly successful venture capital investor for the past 15 years. In particular, Jeff will focus on the differences in skills and approach between being a successful entrepreneur and/or operating executive and being a successful venture capital investor. Hosted by Tuck's Center for Private Equity and Venture Capital and Tuck Private Equity Club. The 14th Annual Tuck Private Equity Conference will be held at Tuck on Friday, February 8, 2019. The conference is designed to strengthen networks among the broad private equity community (including buyout, growth, venture, and corporate venture firms; limited partners and other institutional investors; and banks and professional service firms) as well as to educate and enlighten students, alumni and friends. Hosted by Tuck's Center for Private Equity and Venture Capital and Tuck Private Equity Club. See the conference agenda. The Center for Private Equity and Venture Capital is hosting the third annual research conference in conjunction with the Finance, Organizations, and Markets (FOM) Research Group and sponsored by BlackRock: October 18-19, 2018 in Hanover. The Dartmouth Entrepreneurs Forum (DEF) is open to the entire Dartmouth community. Fellow alumni will come in from across the country and across the business spectrum for fireside chats and industry speakers. 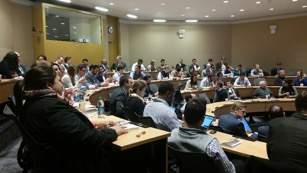 The Dartmouth Entrepreneurs Forum is a bi-annual, coast to coast conference and startup competition, taking place in the fall in San Francisco and in the spring in Hanover. Formerly Dartmouth Ventures, Dartmouth Entrepreneurs Forum | Hanover brings together the Dartmouth community from coast to coast highlighting great ideas and the network of alumni for which Dartmouth excels. Please check back for updates and more details as the event approaches! This invitation-only event brings together senior industry practitioners from the private equity industry and interested students for an information-packed day of keynote speeches and panel discussions. The conference is designed to strengthen networks among the broad Private Equity community (including buyout, growth, venture, and corporate venture firms; limited partners and other institutional investors; and banks and professional service firms) as well as to educate and enlighten students, alumni and friends. Hans Reichstetter T’10 is co-founder of Buffoonery Factory LLC, Grizcoat, and Freezy Freakies and a Kickstarter Entrepreneur in Residence. Nick Russell T’10, Partner at Tuckerman Capital, will be leading an experiential learning independent study course in which a small group of students will develop their investment evaluation and due diligence skills. Students will also complete individual or group research projects addressing a current topic in private investing, or develop an actionable investment theme/thesis. The goal of the class is to provide an opportunity for students to enhance their effectiveness and insight as private equity investors through experiential learning in a small group setting. The program will take place during the winter and spring terms and will count as a three credit elective. Information Session TBD in October with interested students. Course applications (with a research topic proposal) due November 10, 2017. If you would like a copy of the course outline or would like more information about this opportunity, please contact Alison Pearson at the CPEE (alison.pearson@dartmouth.edu). On October, 30, 2017 the Revers Center for Energy and the Center for Private Equity will co-sponsor Yaniv Tepper’s visit to Tuck. Angeleno Group is a Los Angeles-based private equity firm with a global platform focused on high growth investments in next generation energy and natural resource-related companies. Founded in 2001, AG invests broadly across the energy and natural resource industry to support innovative, well managed, rapidly growing businesses. Areas of particular interest include advanced generation, energy intelligence and control, clean transportation, renewables, transmission and distribution, power storage, and energy efficiency and conservation technology. Since its founding, AG has become one of the largest dedicated growth equity investment firms in the sector. AG makes investments internationally with investment professionals based in Los Angeles and Sydney, covering North America and the Asia-Pacific region. In addition to his firm management responsibilities, Mr. Tepper leads investments and serves on boards of multiple AG portfolio companies.